The Wacom Cintiq Pro 24 is an advanced creative pen and touch display, designed to enhance every creative breakthrough. 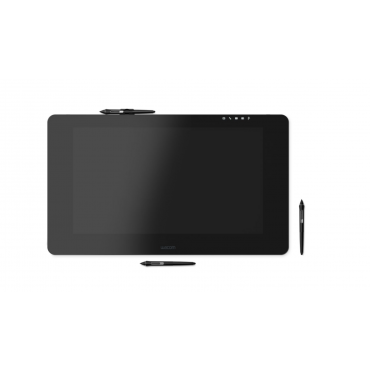 -Includes a Wacom Pro Pen 2 for superior accuracy, tilt detection and 8,192 levels of pressure sensitivity. -Multi-touch gestures, an on-screen keypad, radial menus and the ExpressKey™ Remote offer a more intuitive experience. -Virtually no parallax and jitter while using premium 4K screens, complete with world class Adobe RGB 99% color performance. -Etched glass screens reduce glare and reflections while providing a natural, pen on paper feel as you draw. -Built-in legs raise your Wacom Cintiq Pro from 5° to 20°. -The optional Wacom Ergo Stand lets you raise, tilt and rotate your Cintiq Pro to find the most natural position for you. -Add the optional creative PC module Cintiq Pro Engine to turn your Cintiq Pro into a powerful creative pen computer. -Compatible with Mac and Windows.